President Donald Trump told The Wall Street Journal on Monday that he is prepared to hit another $US267 billion worth of Chinese goods with tariffs – and he is not afraid to put tariffs on consumer goods like the Apple iPhone. Trump’s renewed tariff threat could simply be a “negotiating tactic” ahead of the G20 Summit later this week, and Apple could ultimately mitigate any tariff impacts, said UBS analyst Timothy Arcuri. Shares of the smartphone giant have been under pressure recently – down more than 20% from their October peak. New tariffs on consumer products like the iPhone wouldn’t hurt Apple too much, UBS says. Fears over such tariffs were highlighted Monday when President Donald Trump told The Wall Street Journal that he was prepared to slap tariffs on the rest of Chinese goods not already subject to duties, including some consumer goods such as iPhones and iPads. He also told The Journal it was “highly unlikely” that the US would exit this week’s G20 summit with an agreement to hold off on increasing duties already in place on Chinese goods. The UBS analyst Timothy Arcuri said those threats could simply be a “negotiating tactic” ahead of the G20 summit, when Trump is expected to meet with Chinese President Xi Jinping. He also said that “Apple could ultimately mitigate any tariff impacts” if Trump goes ahead with the plan. Arcuri has a price target of $US225 – 30% above where shares are trading. RBC analysts are also bullish on Apple, saying at least some of the negative news surrounding waning iPhone has already been priced into the stock – which is down more than 20% from its October peak. Earlier this month, the smartphone giant reported underwhelming iPhone sales and said that its holiday quarter would be on the low end of expectations. And two weeks ago, a handful of iPhone suppliers – including Apple’s main Face ID technology provider Lumentum and iPhone radio-frequency chip supplier Qorvo – cut their respective outlooks, citing a drop in demand from one of their biggest customers. Apple wasn’t specifically named. 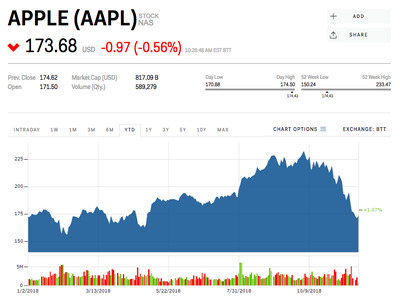 With investors speculating that all these signs point to weakness in new iPhone sales, the Wall Street Journal reported last week that Apple, in October, cut its production plan for its cheaper iPhone XR model by up to a third. Daryanani cut his price target to $US235 from $US240, but maintained an “outperform” rating. Apple shares were up 1% this year.